Christmas is coming! Don’t miss one of the best opportunities to connect with people and grow your church in a significant way. People in your community will be looking for a church to attend this time of year … how are you leveraging this opportunity? People are more likely to invite friends. // It’s a festive time of year and invitations to your church will be at an annual high. Craft your communications strategy around asking people who they are inviting. Ensure the “ask” is clear and compelling so it spreads quickly from your people to their friends and family. Simplify the messaging so it’s portable enough to go from one person to another. Their friends are more likely to attend. // The statistics above tell the story well. 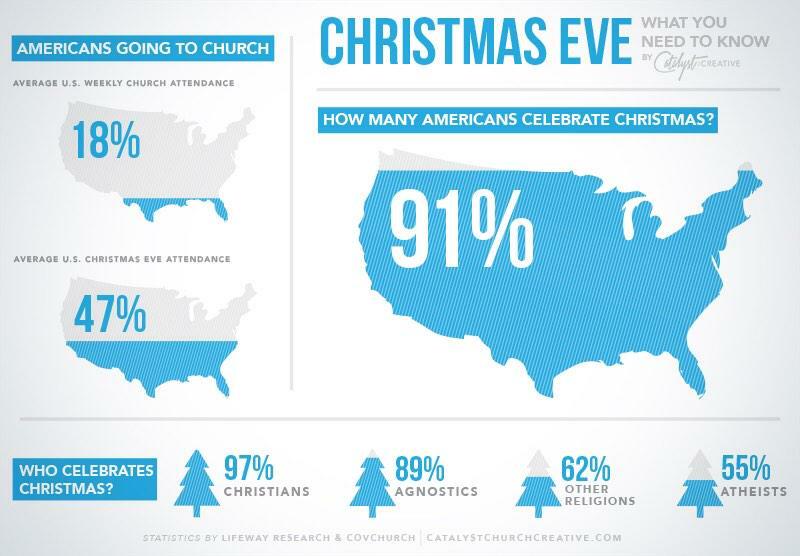 The vast majority of people in our communities are celebrating Christmas … twice as many people will be attending church. When people invite their friends, there is a higher likelihood they will say yes. This creates a positive experience in the inviter’s spiritual journey and is a part of building an “inviting culture” that will help your church grow in the future. How are you building momentum to the “next big thing” with the guests visiting your church this Christmas? Listen to this interview with Hal Seed on how New Song Community Church encourages people to come back in January. What can you plan now to thank your volunteers who will go “above and beyond” to make it great? Here are 33 ideas for thanking your volunteer team. Is your Christmas service press-worthy? Your local media are looking for stories … how can you package what you’re doing and invite them to cover it? Check out this article on making your news story more spreadable. How is your church balancing “traditional” service elements that people expect with current trends that keep your church relevant? This article on cultural trends and their impact on the church would be helpful as a discussion starting point around your Christmas services.